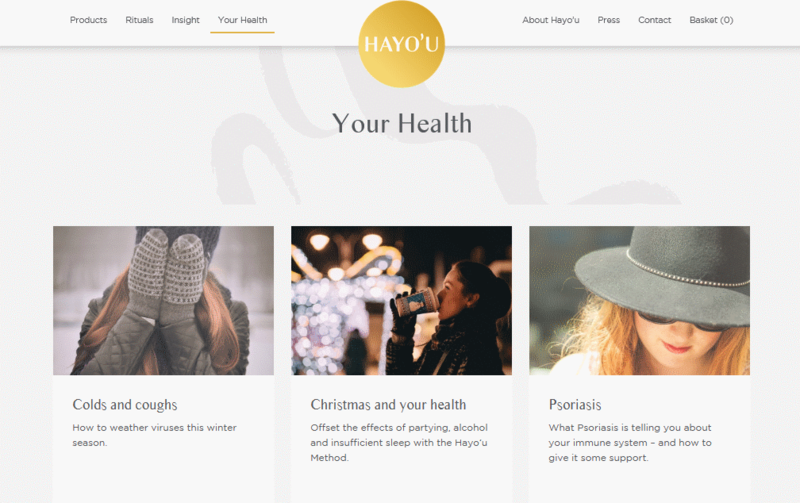 Health and wellbeing brand, Hayo’u Method became HeX clients in July 2017 when we partnered with our good friends at Enchant agency, collaborating with them on the development of the website. The existing version had been created on the Magento ecommerce platform, and it wasn’t working for the team at Hayo’u because it required the skills of a web developer to make even simple changes. So, when Enchant approached HeX, they brought a new website design created by Chris Allwood and asked us to create it. We built their new site using WordPress, and fully integrated it with WooCommerce to provide the ecommerce element. The WordPress platform gives the Hayo’u staff the ability to easily add photos, new products and make changes to content, giving them much more flexibility over their site. However, they also can have confidence that whilst they update their site, the design elements are protected. In terms of site navigation, we created a Products section displaying the range of items Hayo’u sells – and customers are able to click into the items for more information, alongside video guidance of how they’re best used. The Hayo’u Method is based on an aspect of Chinese medicine, Yang-Sheng, which tackles inflammation, thought to be the root cause of most modern-day illness. The Method deploys one-minute rituals that work to clear inflammation on a daily basis and HeX created a section explaining these rituals. Here, videos from company founder Katie Brindle are integrated into the page, helping customers to understand how to complete the rituals and get the best out of their products, in a neat page layout. We also used WordPress Custom Fields to create further sections, such as the Press section showcasing recent press coverage that the company has received and the Your Health section which brings together topical posts based on specific conditions. Clients testimonials were key to Hayo’u site – being an exclusive, unusual product, stories from happy customers are really important to give potential customers confidence in the product. Under the banner ‘Real People. Real Results’, HeX’s developers took images and stories and developed a fully integrated scroll bar of testimonials on the homepage. These are clickable, giving more detail behind the scenes and was built using the ever-versatile WordPress’ Custom Fields. HeX used WooCommerce as our ecommerce platform of choice to give the Hayo’u site a slick checkout process when customers go to make a purchase. It’s simple to use, easy to develop on and works alongside WordPress beautifully. In addition to building the website, HeX supported Hayo’u with their content migration, which basically involved a two-stage process of automatic and manual transfer of pages from the former website into the new WordPress one. This is an add-on service that we offer to clients who need it. Hex have delivered Hayo’u with a fully responsive (i.e. works on PCs, mobiles and tablets) new website and shop experience, so it will suit customers no matter where they’re browsing from. And following comprehensive training, their staff have the ability to make changes when they want to, handing them back the control they were looking for.